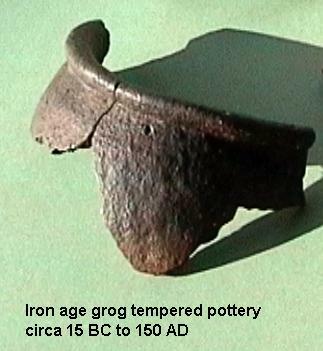 THE BRONZE AGE/EARLY IRON AGE . Until recently that was the only indication we had of possible settlement during this period in the immediate area of Leverstock Green. However in February 1995 the Hertfordshire Archaeological Trust carried out an excavation on land to the west of Buncefield Lane. The excavation had been commissioned from the Trust by the New Towns Commissioners prior to the development of a new distribution centre. The excavation identified three distinct phases of archaeological activity at the site. The first phase being from the Bronze Age/early Iron Age period and showing distinct signs of occupation, though no definite structures in the area. The most interesting features included a hearth-dump and a large ditch terminal. A hearth dump was a pit into which the spoil ( ashes and other debris from a fire) from a hearth was put. It is also a matter for conjecture, and with no real concrete evidence to support it, but it is possible that the line of the original Buncefield Lane/Westwick Row formed part of an ancient trackway, perhaps linking the area around Markyate to the area of the iron-age settlement in Prae Wood. My attention was first drawn to the possibility of the line of Buncefield Lane and Westwick Row - and others - being linked by Alan Greening, the Architectural Historian who has worked on Westwick Cottage and other property within Westwick Row. He suggested that if you looked at the original 1st edition O.S. maps you could see that the lanes were connected and continued from Markyate and through to join with the end of Buncefield Lane at the crossroads with Three Cherry Trees Lane and on through to Westwick Row and beyond towards Abbots Langley, or the southern approaches of St. Albans. Thinking on what Alan said, and looking at the maps myself, it was even possible to trace the apparently continuous line of routeway on a modern ! :25000 O.S. map. However, my knowledge of Westwick Row itself and the pattern of settlement there, suggest that the trackway, if that is what it was, would have been in existence before the middle ages, and would at the very least been of Anglo Saxon origin, but reinforced during early Medieval times when it may have formed a pilgrim's approach to the Abbey from the southern end of Holywell Hill. Giving the matter considerably more thought, and studying the pattern of the very old roads etc. it occurred to me that it might even have been earlier still. 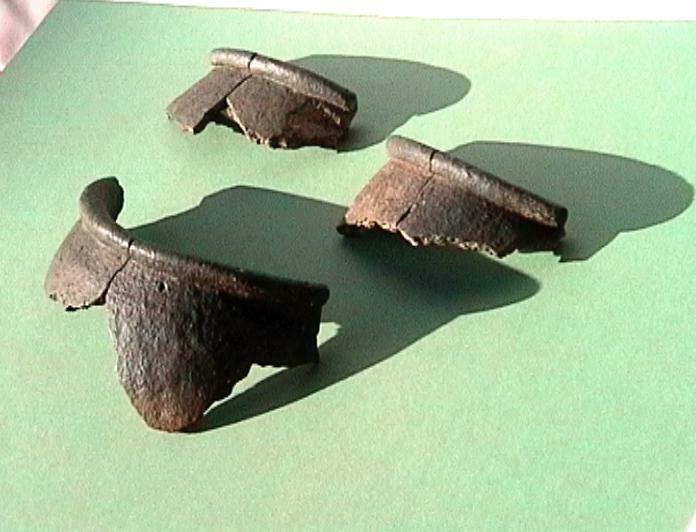 Bronze-Age and Iron age artefacts and evidence of settlement have been found in recent years just off Buncefield Lane. Sir John Evans found Bronze- Age horde along Westwick Row, and Prae Wood, a major Iron Age settlement. The apparent continuous trackway linked them all. This seemed even more likely when I discovered quite by chance from a school book in a school at which I was teaching on supply, that there was supposedly some pre-Roman settlement in the Markyate area. I had previously only though of Markyate from early Medieval al times, when it was a centre for religious hermits, and later a nunnery founded by Christina of Markyate in the 12th century. The book I was reading included a fictional tale about a boy living in an early iron age village in the Markyate area, and included some legend. If a trackway was formed linking the iron-age settlement in what became the Markyate area to the settlement just outside St. Albans and now part of pre Wood, then the development of further settlement along the route at various points in time, makes more sense. The results of the archaeological evaluation at Handpost Lodge in July/August 1998 only serve to reinforce the idea that Westwick Row may have formed part of a very early trackway or drovers route. The following front page article appeared in the Hemel Hempstead Gazette for Wednesday 29th August 2001. 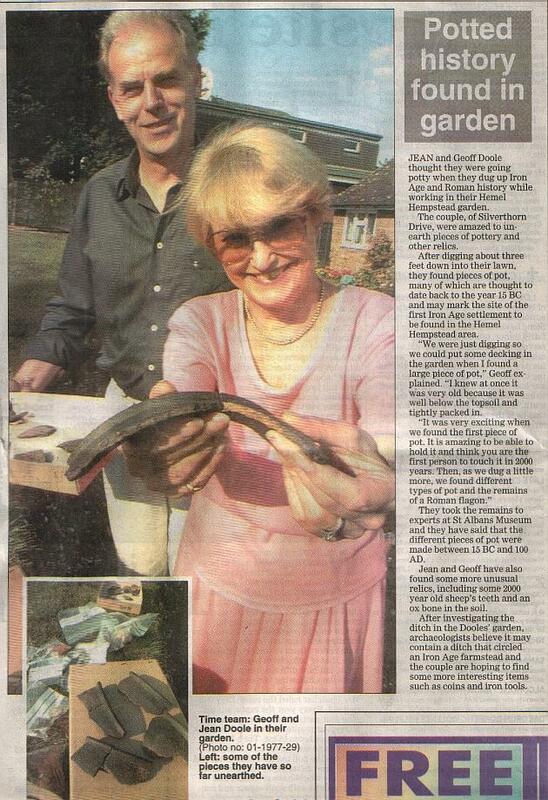 To date (1st September 2001) I know little more than is in the article other than the fact that it was archaeologists from Verulmium Museum who undertook some excavation in the Doole's garden after Mr & Mrs Doole took their finds to Verulam Museum for verification. 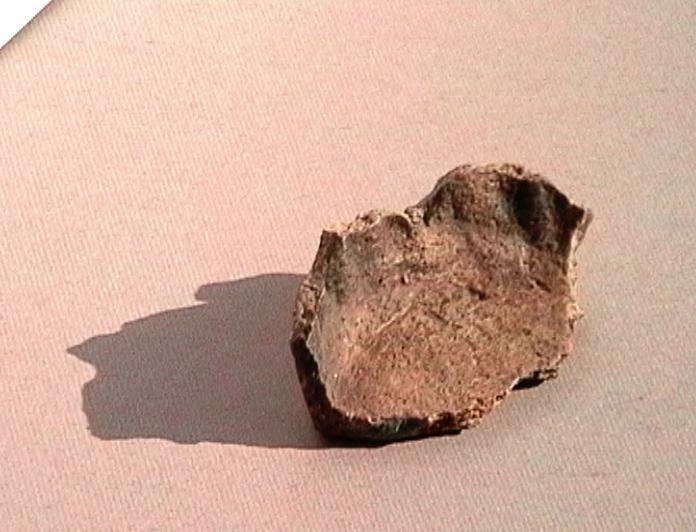 It seems likely that if further excavations were undertaken in the area, considerably more iron-age and possibly Roman material would be found, given what has already been discovered. This despite the development of the Longdean Estate in the 1970's, which from the archaeological point of view has the merit of gneraly being large houses on large well spaced plots, so that disturbance of any archaeological material would have been minimal. 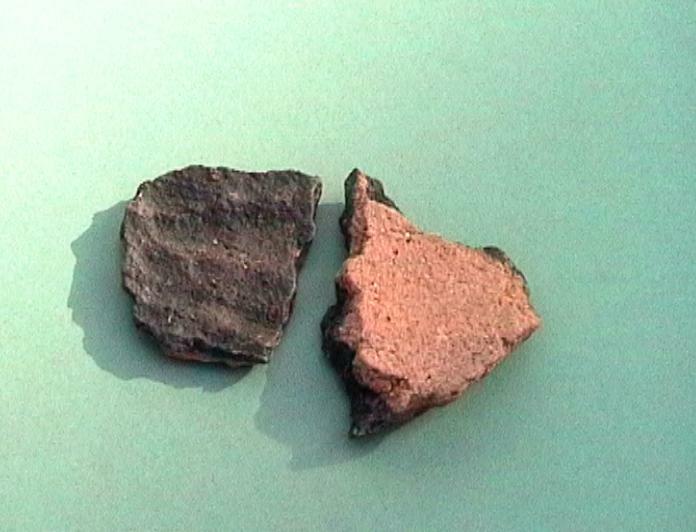 With this discovery it immediately seemed to me that perhaps the whole local landscape is basically of Iron-Age rather than Roman Anglo-Saxon or Medieval in its origins. Occupation on previous Iron-Age sites was often continued in Roman times, and in the case of settlement along Westwick Row, this continued through the Anglo-Saxon and Medieval periods to the present day. Looking at the 1877 6" OS map, the "removal" of the Roman Roads (Bedmond Road and St. Albans Road - now A4147) shows many of the field boundaries to run from Westwick Row SW in the general broad S "furlong ploughing" pattern which is typical of the area. Not all the boundaries match exactly, some are "near misses". In other words they were there BEFORE the Roman occupation of the area. This therefore leads me to suppose that these ancient field boundaries and "hollow ways" were not Medieval, or possibly even Anglo-Saxon as previously thought, but instead date from at Iron Age. It therefore seems to me that the Blackwater/Bunkers Lane, route, was in fact a trackway linking the probable settlement along Westwick Row with what has now been discovered just off Bunkers Lane at Silverthorne Drive. Even more astonishing, as before looking at the map it had not seemed so obvious, was the link from the site at Handpost Lodge to where Chambersbury Lane meets the present day Silverthorne Drive. Silverthorne Drive itself follows the natural contours of the land as can be seen quite clearly if looking at a modern OS map. Click here to see map. This then also seems to beg the question, if these field boundaries/trackways are as old as the Iron-Age, can we presume the whole pattern of "s" shaped furlong field boundaries throughout much of the Chilterns dates to that age as well? If such a large area was down to the plough so early on, that also suggests to me a much larger Iron Age population in the region than has been considered possible before. I have since discovered that the boundaries actually directly connect between the Handpost Lodge site and Silverthorne Drive [click here to view map] (which incidentally follows the natural contour of the land.) This seems to me to strengthen the theory, as Iron Age folks living so close to one another would probably have some interplay with one another. On the map Silverthorne Drive is shown as a red line, the Handpost Lodge site as a green splodge. I've marked what I consider major Iron Age trackways (because they are obviously ancient routeways rather than just field boundaries as they are all in some places incised into the landscape due to the continual wear over the centuries (or millennia!). The orange field boundaries shown how they could have been prior to the Roman Routes, though there could well be many more. Who knows how many more Iron Age sites will be found in the area in the future to further reinforce this idea? To the right and below are some of the photographs taken by Geoff & Jean Doole of the finds from their garden, and which they have kindly given me permission to use here. Others can be seen onthe page relating to Roman Leverstock Green. Prior to the widening of the M1 in 2006, various archaeological work work was undertaken. Two digs at Junction 8 uncovered some very exciting material, ranging from the Iron-age through to Medieval times. Click here for further details. These latest finds reinforce the importance of the area archaeologically and the theory of it being intially an established Iron-Age landscape which has continued to be of importance through the Roman, Saxon and Medieval period.